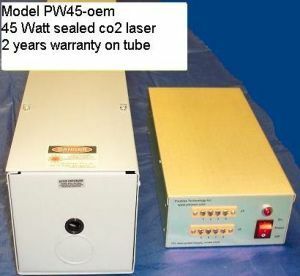 These co2 lasers are packaged for Original Equipment Manufacturers and System Designers who prefer to purchase a packaged co2 laser system rather than naked oem laser tube plus power supply. 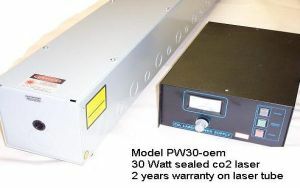 We offer these economical co2 lasers in three (3) power ranges, 70, 45 and 30 Watts and they all have two (2) years power warranty on the tube. 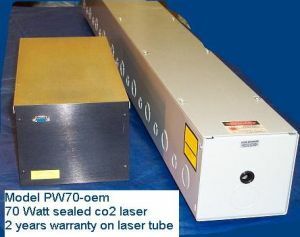 Prices and specifications for oem co2 laser systems. Prices and specifications subject to change without notice. Please check these pages. 70 Watt TEMoo, 6 mm beam diameter. System comprising of the laser head, power supply and a hand-held controller. Laser head, inch (cm)= 60 x 6 x 6, (152 x 15 x 15). Power supply = 17 x 6.5 x 7.5 (43 x 16.5 x 19 cm). 45 Watt TEMoo, 6 mm beam diameter. 30 Watt TEMoo, 6 mm beam diameter. System comprising of the laser head and power supply.